As modern human beings, we spend roughly around 90% of our time indoors. That’s a lot isn’t it? We also spend about 9 years of our lives watching TV! With us spending so long indoors, have you ever considered the quality of the air you breathe and the implications on your health? In an ideal world a humidity level of 40% - 60% is recommended and this level is not often reached. The micro-fine ultrasonic air humidifier operates quietly so you can reap the benefits without being disturbed, making it perfect to have in your room or even your infant’s room. It has a low-energy operation of only 20watts so it’s great for the environment and your pockets. It is suitable for rooms which are up to 25m2 and boasts a humidification output of 220 ml/h. Why do you need an ultrasonic humidifier? If you have been going through your everyday life without the benefits of an ultrasonic humidifier it’s time to stop and reassess. Air humidifiers add beneficial moisture to the air and prevent dryness which may have been causing you irritation to many parts of your body without you even realising. If you suffer with dry skin, a dry nose, throat and lips then you will benefit from the moisture infused air a humidifier will produce for you. How does the Beurer Air Humidifier LB 44 work? The principle of the mini humidifier is based upon high frequency vibrations releasing tiny drops of moisture from the surface of the water. The fanned air flow transports the humidified air out into the room. Simple, easy and effective. Want to know what other benefits you can enjoy from the Beurer LB 44? Relief from sinusitis – In dry air your sinuses can’t drain or function properly so adding moisture to the air is generally good for your sinus health and helps them function better. Heal faster – Moisture produced from your air humidifier can help keep your nasal passages more lubricated which can aid in the healing process if you are ill or have a sore nose from a cold or allergy. Less nose bleeds – If you are unfortunate enough to suffer from pesky nose bleeds many people have found that with more lubricated nasal passages due to the moisture from a humidifier they have less occurrences of nose bleeds. Quieten that loud snoring – If you live with a loud snorer, or you are one yourself, the extra moisture in the air keeps the throat from drying out so much which will help quieten down that irritating snoring. Helping with beautifying the skin – Sleeping with a humidifier on through the night will help you if you suffer from dry skin. You will notice your skin feeling more moist and subtle as well as your hands and feet so your humidifier has beauty benefits too! 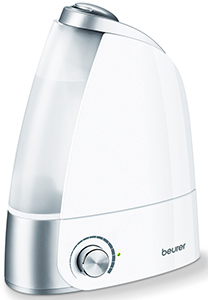 The Beurer Air Humidifier LB 44 has a removable 2.8l water tank and a visible water level in the tank. It automatically switches off if the tank is empty for your peace of mind and includes cleaning brushes and a 3 year warranty.